Kramer Construction understands the issues that come along with needing a roofing replacement rather than a roofing repair. 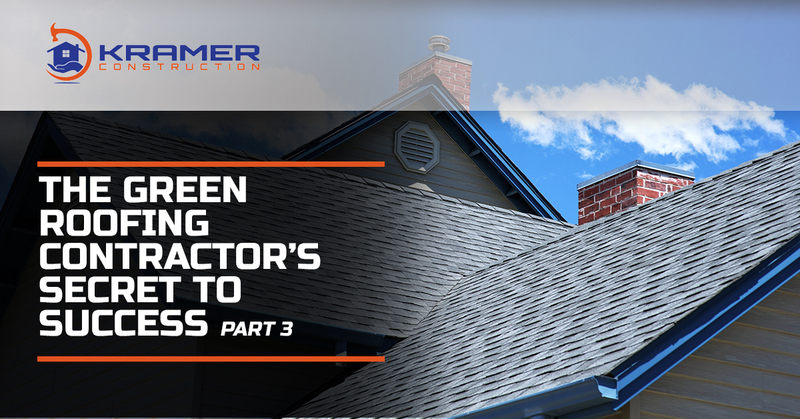 Whether you had a roofing contractor diagnose your roof as terminal, or you figure it’s been over 50 years and it’s about time to invest in the upgrade, it can be daunting to sort through all of the information about roofing out there. From slate to composite slate, and from wood shakes to cement tiles comparing most roofing materials is essentially nearly impossible especially when you have no real way of estimating the cost yourself. We’ve compiled our top favorite roofing materials and how to find the most earth-friendly roofing materials around like a pro. It’s pretty easy to find out if something has recycled materials in it. It’s a major marketing point for most products nowadays and you won’t have to search the box long to find that credential. Let that be a factor in how you’re making your decision and then find out if that material can be recycled again once you’re finished up with it. There’s no reason to add an entire roof’s worth of materials to the garbage pile outside of town if you don’t need to. Making sure a roofing material is durable goes a long way in ensuring you aren’t using more of it than you need to. Search for durability and recyclable contents to ensure that it’s earth smart in many respects. Some coating is bad for aquatic life as well as the people drinking water downstream from you. If something is coated with copper or zinc, it’ll wash into your downspout, into the water system and eventually into the bloodstream of the animals and people who live near you. The color and reflective nature of your roofing can save you money on your energy bill, and bring down your carbon footprint as a whole. Since South Carolina sees plenty of sun, you’ll want a lighter color or a roofing material with high reflectivity to bounce that heat away from the house so you aren’t blasting that air conditioner quite as much as you could be. As the premier roofing contractors in Mount Pleasant, we’re equipped with not only the knowledge but also the vast experience to help you determine what roofing material is best for the earth, your budget and the look of your home. Schedule your roof replacement consultation now.